Welcome, We would like to introduce you to Carmagazine, the worlds first Automotive interactive magazine. By far it’s the best magazine that many have ever seen. Unlike other magazines we provide you with the richest content, detail, quality, and the ability to interact with every picture down to every word in our magazine. Viewing things like 3D cars, videos, & other interactive features right inside the magazine. This allows you to truly feel for each and every vehicle down to the sharpest point. Our goal is not to be the best magazine but the ultimate magazine, & with every day that passes we get closer to the future of magazine, and the future of reading. 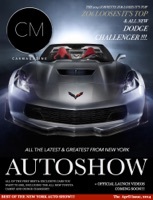 This issue of Carmagazine includes what we think to be the best cars from the NY autoshow & more. So go ahead and download our magazine & see why so many people worldwide love Carmagazine.